No, this is not a picture of the thirties! Instead this view sums up what was left over for a restart of motor racing in Germany after the war: While formerly the spectators had been accustomed to full Mercedes and Auto Union teams totally dominating all the big races of pre-war time, they now had to be content with a hodge-podge of cars, mostly ancient pre-war models, mixed together without regard of any classification in order to gather enough cars just to get a race. Here at Hockenheim in 1947 the field ranged from Egon Brütsch's big supercharged 3 litre (? - that's what the sources tell!) Monza Alfa Romeo from 1932 via Leonhard Joa's also supercharged 1500cc Maserati 4CM Voiturette from 1938 to Hans Stuck's almost tiny unblown 1100cc Cisitalia-Fiat of 1946, all of them of Italian origin. Interestingly at the end of the race the order was just reversed… In fact this collection of race cars was almost all what existed and was worth to be regarded as a race car at that time in whole Germany! And look at the crowd! The picture is a true indication for how little was required to satisfy the people in this war-shaken country and how important and eagerly expected events like this were on the way back into normality. For a proper impression of what it meant for the spectators to visit a race one has to imagine the economical conditions of that time: If one had been one of the few lucky ones who had salvaged an old motorcycle or in some cases even a car, you still had the problem of getting some fuel. This was strictly rationed by the allied occupation governments and apart from this you would not have been able to buy some as money was virtually worthless anyway. So if you had not converted the engine to wood-gas operation you had to find some valuable goods for exchange on the black market, cigarettes, stockings or even food. So most people made the journey from all parts of the country by railroad, horse cart, bicycle, or even by foot. The more astonishing was the number of spectators there, as altogether some 200,000 had gathered under these circumstances to watch the race! After covering the cars that were present to revive motor racing in Germany again after the war - usually pre-war machines of foreign production - this article then focuses on German drivers continuing this tradition as members of teams from abroad. It is quite astonishing how enthusiastic motor racing was reintroduced in Germany within only a single year after the end of the war. Of course nobody could afford being very choosy for the first race, the Ruhestein hillclimb, as of course most of the material had been lost, and nearly everything that remotely reminded to something like a race car was brought there. So besides a fleet of the inevitable BMW 328s a variety of totally obsolete cars appeared for the start, cars which somehow had survived the war, like the Bugatti in this picture, the headline appreciating the rebirth of racing in a German motorsport journal. Most of the cars disappeared after the first two seasons, but they had helped to bring motor racing on its feet again. It seems that none of these cars survived that season very long. For example the engine of Herbster's Bugatti was already transferred to the very first Veritas Monoposto at the Eggberg race before being installed into Brütsch's second single-seater in 1949. For Brütsch's mighty Alfa Romeo itself and Joa's Maserati the Eggberg hillclimb seems to have been the final event, too, since after their engine failures at Eggberg both cars don't turn up in the sources anymore. After that only Deutz's Monza still appeared regularily until the end of the season. In 1949 enough new designs became available so that the old cars could finally be put aside. Generation meeting: Georg Meier in the brand-new Veritas RS in front of Hellmuth Deutz in the ancient Alfa Romeo Monza, Schottenring 1948. 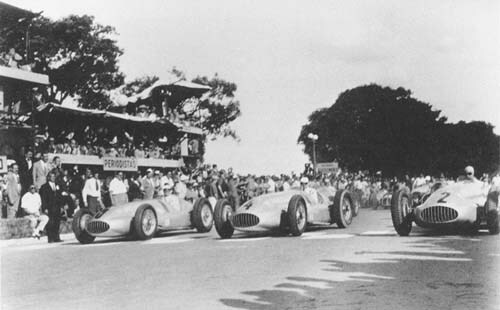 First start of the Mercedes team after the war: Kling, Lang and Fangio in their W154s at Buenos Aires in 1951. Before finally returning to top level racing again the Mercedes-Benz company dusted off their pre-war Grand Prix cars again for what was intended to be some sort of test run in two Free Formula races at Buenos Aires early in 1951. 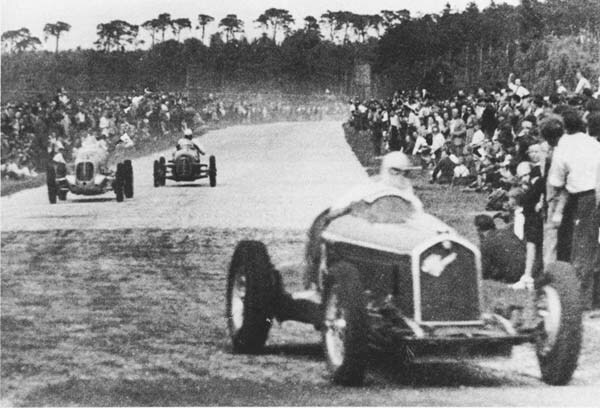 But despite their pre-war hero Hermann Lang being accompanied by German star driver Karl Kling and future champion Juan Manuel Fangio himself it became clearly evident that these cars were outdated by now, being beaten by Gonzalez in a supercharged version of the contemporary 2-litre V12 Ferrari in both races. So after this brief appearance Mercedes instantly retreated again to prepare for 1952, when they produced their legendary 300SL "Gullwing" sports cars before sweeping the Formula 1 scoreboards in 1954 and 1955. Hans Stuck in the neat little Cisitalia at Hockenheim in 1947. In the late forties Piero Dusio had ambitious plans of establishing an 1100cc series across Europe, which of course should be run with cars of his own Cisitalia company. To open the German market he contacted Hans Stuck, who should promote his cars by taking part in the local races. Of course this was an offer Stuck could not resist, as he was desperately looking for a competitive car. The Cisitalia, despite its little unsupercharged engine of only 1100cc capacity, was certainly just what he had looked for. With its modern chassis it showed far better roadholding than the much bigger and heavier racing machinery which existed in Germany at that time. This was soon proved here at the Hockenheimring, when Stuck beat the much more powerful supercharged cars of Joa and Brütsch. To Stuck's regret Dusio had by far overstressed his small company's financial limits by also trying to set up a full Grand Prix programme, for which Professor Porsche designed the infamous Tipo 360. So the Cisitalia company had to be closed down and Stuck was without a drive again until he was picked up by von Falkenhausen in 1949. 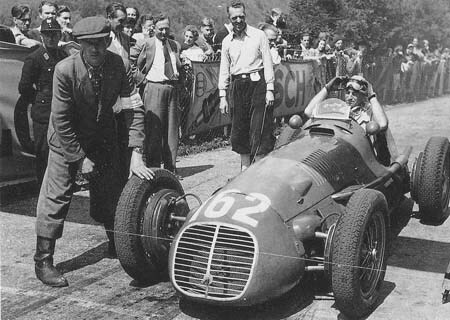 Paul Pietsch preparing for the start at the Schauinsland hillclimb in 1950 in his San Remo-Maserati entered by Scuderia Milan. Paul Pietsch revived his pre-war connections to Maserati, where he had been member of the works team in 1938 and 1939 (one should remember his famous drive into third at the German Grand Prix in 1939). 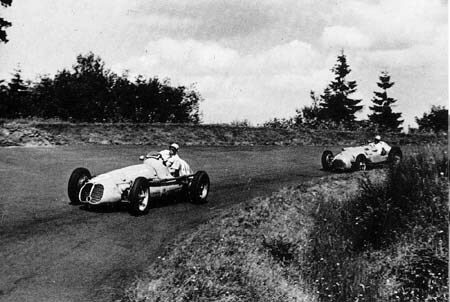 Pietsch in the Maserati in the first practice session at the German Grand Prix in 1951, followed by a Lago-Talbot. In 1951 the German Grand Prix was run to Formula 1 rules for the first time. In order to take part in his home event Pietsch was able to get a guest drive in a Maserati again, this time in a car entered by Enrico Platè. But after the first practice session he was offered the cockpit of one of the all-conquering Alfettas, which he simply could not turn down. After that he did start in the Maserati at the Schauinsland, where he was beaten into third place by Swiss drivers Rudi Fischer and Toni Branca. After that Pietsch concentrated on racing his Veritas Meteor until this was completely destroyed in his accident at the Avus in 1952. After that he made a final appearance at the Eifelrennen in 1953 in the Formula 2 Maserati A6GCM of Scuderia Milan. But to his great disappointment the car had again received hardly any preparation at all, probably a final step on his decision towards retirement. At the following German Grand Prix Fritz Rieß and Hermann Lang both could not afford the offer of the Maserati factory to drive the team's fourth car for financial reasons, but obviously Lang managed to open up some financial sources as he became the first German driver to score world championship points with his finish in fifth place at the Swiss Grand Prix in the works Maserati. 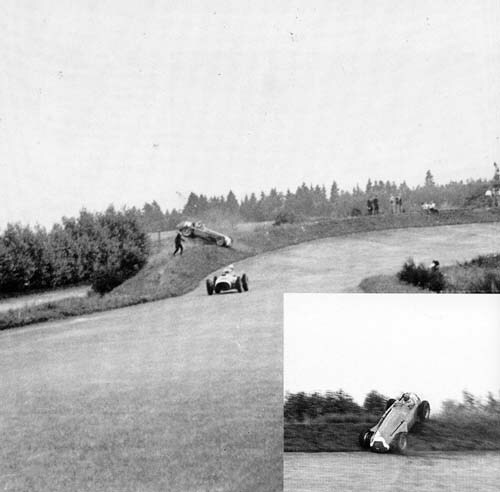 Paul Pietsch spinning the Alfetta out of the 1951 German Grand Prix after his attempt to outbreak Villoresi's Ferrari at the end of the finishing straight at the Nürburgring. 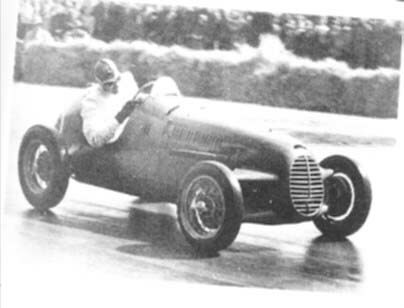 Paul Pietsch was the first German driver to take part in a Formula 1 Grand Prix when he was invited into the all-conquering Alfa Romeo factory team for his home race in 1951. In that period Alfa Romeo followed the policy of taking up a local boy into the team at every event in order to gain some sympathy from the home crowd. But when their offer for the Nürburgring was turned down by Hermann Lang their choice was between Consalvo Sanesi, Louis Chiron, Willy Daetwyler and Paul Pietsch alongside the regular team drivers Farina, Fangio and Bonetto. The final decision would be made in a selection procedure according to the lap times each of the four candidates achieved within three practice laps during the second session. Clearly Sanesi had the advantage of being very familiar with the car, as he was Alfa Romeo's test driver, but Pietsch profited by his good knowledge of the demanding circuit, which secured him the drive. Still not very accustomed to the car Pietsch did well to cross the line in fifth position after the first lap, but the he spun at the Karrussell and had to let the whole field pass by. In his attempt to regain the lost ground he tried to outbrake Villoresi at the beginning of the 13th lap but overdid things again and spun over the top of the banking. Luckily the car did not turn over so Pietsch could walk away a very disappointed man but nearly unhurt. His only injuries were a contusion of his legs and a bleeding lip, on which he had bitten during the accident. But his car was in much worse state and so his race was over – as was his Formula 1 career. Grid of the 1953 Eifelrennen at the Nürburgring: At the front Kurt Adolff (34) in the Ferrari 500 of Rudi Fischer, Paul Fre&grave;re (12, HWM), Hans Klenk (30, Klenk/Veritas Meteor) and Stirling Moss (8) in the Cooper-Alta Special. Car 32 in the second row is given as Adolf Lang's Veritas, but it looks rather like Barth's EMW, so perhaps there is a mismatch in the starting numbers. Behind Fre&grave;re Helfrich's Veritas RS just sneaks out into the picture, while the third car is an AFM, possibly that of Hans Stuck. 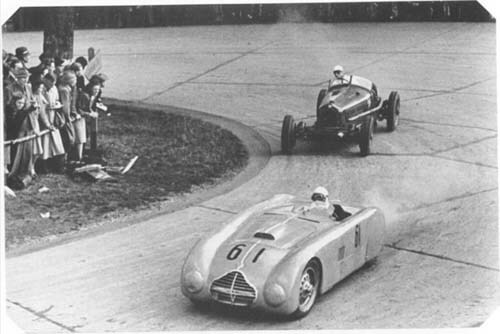 In the gap between Adolff and Fre&grave;re the No.17 Maserati A6GCM/53 of de Graffenried, the later winner of the race, is clearly visible, while the car covered by Helfrich's Aerosaur is most probably the new Veritas Meteor of Willi Heeks. The rest of the grid is made up mostly by a collection of Veritas RS sports cars with an older 1952 Maserati A6GCM just at the left edge of the picture. After Swiss Rudi Fischer's participation with his V12 Ferrari in the 1951 German Grand Prix the red and white cars of his Ecurie Espadon (the word meaning "swordfish") became a familiar sight on the German race tracks. At the Avus race in the same season he could not impress the locals too much, finishing third behind surprise winner Greifzu and Ulmen's Veritas RS streamliner, but this would change soon when Fischer ordered one of the legendary Ferrari 500s, the very same type of car in which Alberto Ascari was about to win the world championships in 1952 and 1953 in an overwhelmingly superior manner. With the new car available for himself in 1952 Fischer was now able to rent his old V12 Ferrari to other drivers for some good money. In the Swiss events the drive was usually given to Peter Hirt, who had finally recognized his own Veritas Meteor as a lost cause, while at the Eifelrennen Fritz Rieß became a true predecessor of Wolfgang Graf Berghe von Trips and Michael Schumacher, the first German to start a top-level Formula race in a Ferrari single-seater. But while Fischer himself in the new four-cylinder car won comfortably from Stirling Moss in the HWM Rieß was not among the finishers there. At Avus the cockpit was given to Hans Stuck, who had recently given up his struggle with the unreliable Küchen engine in his AFM and ordered a Bristol six as a replacement for 1953. So Fischer's old Ferrari was a welcome occasion for him to stay in the game, even if the open-wheeler could not be regarded as a true winner on such a high-speed event. The race was again a true affair for Fischer's Tipo 500 while Stuck finished fifth, already lapped by his team owner. After his good results in the world championship in 1952, in which he ranked fourth at the end, Fischer was deeply disappointed when he was refused a Ferrari works drive for 1953 by the Commendatore and decided to end his career as a driver and concentrate on running his team instead. After some negotiatons he surprisingly signed up new hopeful Kurt E. Adolff to drive his car for the German events instead of Hans Stuck, who had been the favourite candidate with the German public. The first appearance of the new car/driver combination was here at the Eifelrennen, where Adolff made good use of his certainly superior equipment to qualify for a front row position on the grid. Immediately after the start de Graffenried shot into the lead from the third row of the grid and Adolff was able to hold second position for a while before he had to surrender to the attacks of the HWMs of Collins and Fre&grave;re, finishing fourth as best of the German drivers there. At the Avus Adolff was out of the race as early as on the second lap, when he left the road and his cooperation with the Ecurie Espadon finally was ended after yet another disappointing result in the German Grand Prix, where he retired on the fourth lap after an unimpressive drive at the rear of the field. Another German achieving agreement with a foreign team was Helm Glöckler from Frankfurt, who appeared on the entry list of the 1953 Avus race intended to drive a Cooper of Equipe Anglaise. But his entry there did not materialize so he had to wait for another chance at the Grand Prix. This time he at least managed to take part in practice. But then he suffered an engine failure and had to watch this race from the sidelines, too. The author appreciates receiving feedback and/or any information to improve his article. You can reach him at uechtel@gmx.de.